Transform into the Spanish fox in this men's Zorro costume. 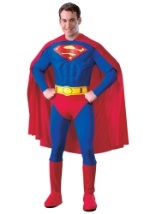 This authentic costume includes a black, polyester jumpsuit that laces up in the front and has a muscular chest. A belt with decorative trim and Zorro's signature "Z" wraps around the waist and a matching hat is also included. The black, flowing cape clasps around the shoulders and is also lined with decorative trim. Add the black eye mask to keep your identity a secret this Halloween season. Complete your look with our Zorro sword or whip to bring the Legend of Zorro to life.